Since moving to the new neighborhood I've heard a lot of good talk about Piece. Word on the street was that they make good pizza and brew award winning beer - and there's always a long wait. This thursday we learned all three are true. I'm a Chicago deep dish pizza lover at heart so it's hard for me to get too excited about various thin crust options but piece makes a solid thin crust. They call it "new haven" style but that's likely just marketing. There are no pre-set pizzas to choose, everything is build your own and starts with one of four sauces: red, bbq, white and plain. Even though we arrived on the later end at 8:15 we still waited at least 45 minutes for a table and the place was always packed (maybe for thursday night karaoke??). I loved the feel and decor of the barn/brewery style. I could picture it on the side of a ski mountain out west if you added a fireplace and the loud noise of ski boots. The brand name beer was very good and deserving of the many awards decorating the walls. 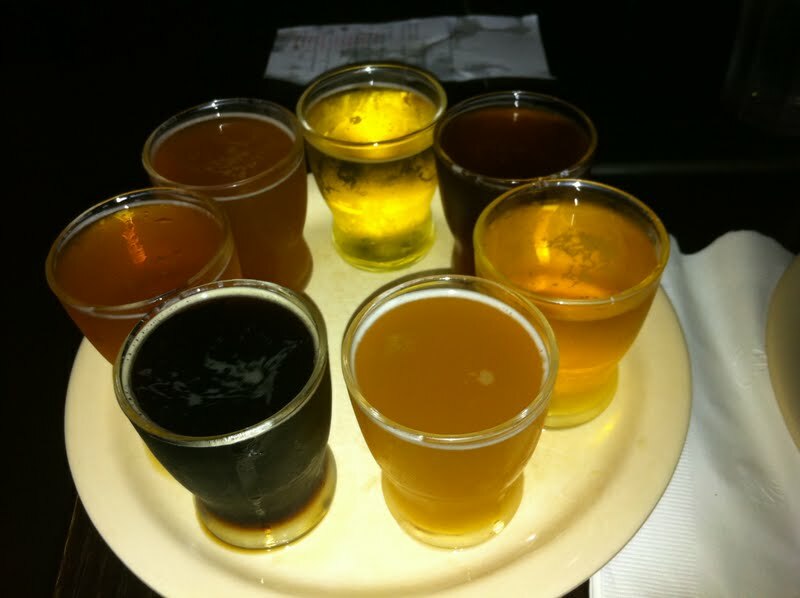 Ari and I enjoyed a sampler flight to make sure we didn't miss anything. Lastly, the value was surprisingly good. Three pizzas, one starter and some drinks we ended up at $20 a person all in with leftovers. We started with a very tasty and perfectly sized spinach and cheese dip with tortilla chips. We were all very hungry and needed something before the pizza arrived. I don't know exactly how long we waited but it didn't seem out of the ordinary. 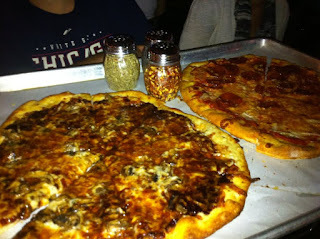 We choose three different kinds of pizza to try and share - red sauce, white sauce and bbq sauce. The bbq had mushrooms, the red had pepperoni and onion and the white was artichoke, spinach and broccoli. Each pie had different strengths and all were tasty. My favorites were either the bbq or the pepperoni depending on the minute. 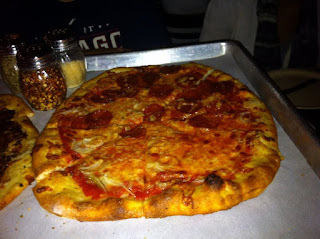 I thought all the pizzas actually tasted better the more they cooled as the sauce became more firm and the crust hardened. The bbq would have been even better with a protein like chicken or something to go with the sweetness of the sauce. 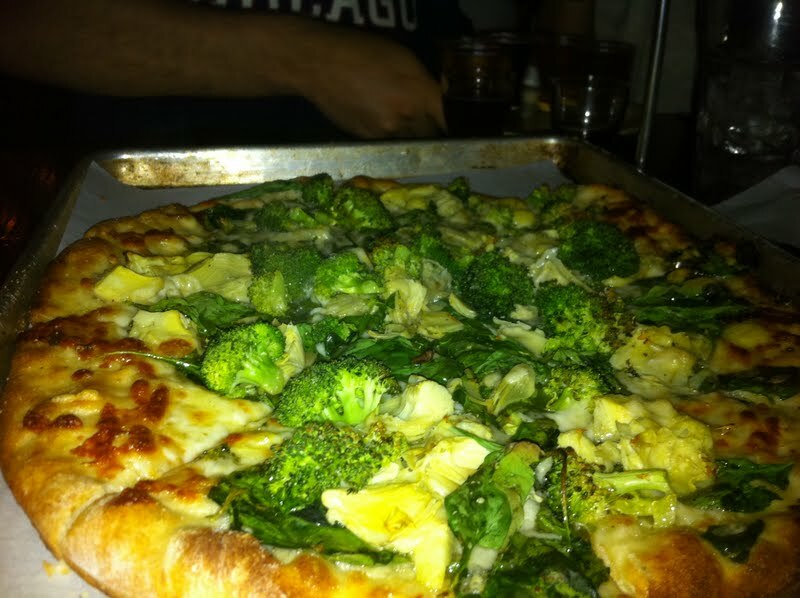 I did like the veggie white pizza but just not as much as the other two. All of the beers were very good, which is an accomplishment when there are six to try. My favorite was the anniversary ale. I'm happy that our experience lived up to the good press and word of mouth. I would happily spend nights there drinking beer on a cold and snowy evening or a nice summer night like last week. The biggest complaint is the long wait for a table and sometimes the staff is a little preoccupied with themselves than the guests. The pizza's good, the beer's great and the value surprising. If the wait it too long next time we want to go I guess there's always the takeout window.